The taste for Oriental and exotic themes had spread across France during the 18th century and became more pronounced with the advent of Romanticism. Delacroix was influenced by this trend but it was in fact his trip to Morocco that would mark a turning point in his career. In 1832 the artist accompanied Count Charles de Mornay on an official trip around North Africa, including Morocco and Algeria, while Delacroix also found time to visit southern Spain. This long trip, which lasted from January to July, continued at Mequinés, where the artist arrived on 15March and where the diplomatic mission that he accompanied was received by Sultan Abderraman on the 22nd of that month. In early April Delacroix returned to Tangier, then travelled to Spain, returning to North Africa in June at which point he visited Algeria and Oran. His trip would provide him with material for the remainder of his career, and Delacroix made numerous sketches and drawings that would provide the basis for future compositions. He was fascinated with Arab culture and his impressions are also evident in his letters and other writings. In Africa, Delacroix discovered the classical world of the academic painters, seeing it, however, alive and before his eyes in the gestures of the inhabitants, their customs and clothing. He complained, however, that he could not draw the women as their Muslim culture made them inaccessible and he was only able to depict Jewish women. Among the numerous motifs that fascinated and enchanted the artist was that of horses. He noted that he took great pleasure in studying them and praised their energy, spirit and competitiveness. The present Arab Rider is one of the images produced during his Moroccan trip. Dated to around 1854, it shows an Arab seated on the ground resting before a fire with a sword hanging from his belt and a weapon in his hands. Next to him a fiery black horse of elegant proportions and long mane conforms to Delacroix’s habitual descriptions of these animals. The panel is one of a series of depictions of scenes and motifs from the Arab world, in this case its horses, which he depicted at a rapid gallop, fighting, starting a race, or being prepared for mounting. These are compositions in which the painter was not concerned to achieve a realistic representation but rather to convey the animal’s presence through colour and movement. The panel, which is signed at the lower right corner, dates from the moment when Delacroix paid most attention to the backgrounds of his compositions. 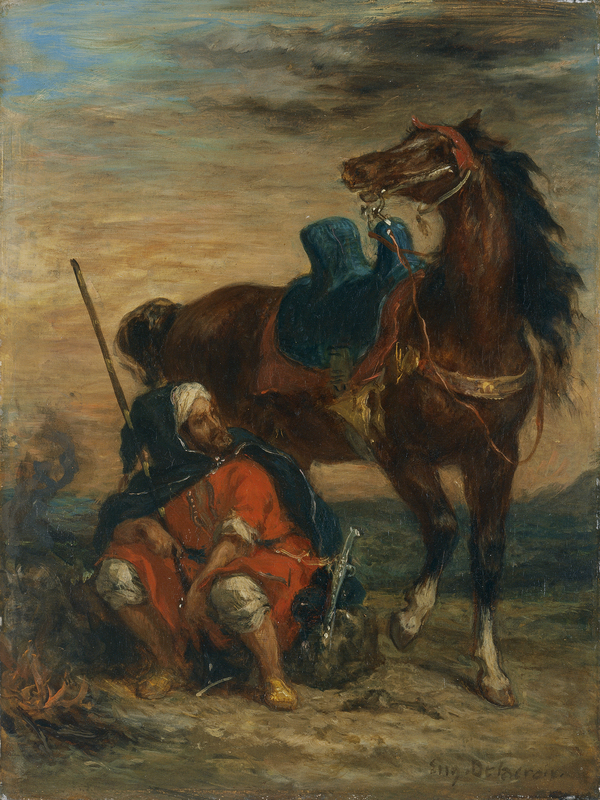 It was identified by Moreau-Nélaton as the painting mentioned by Delacroix in his Diary of 23 April 1854 as, “a small Arab seated and his horse behind him”. The painting entered the Thyssen-Bornemisza collection in 1972 from the collection of Eduardo Mollard.